A wooded hillside site near the farm (mixed farming, poultry, vegetables) with fine views of the surrounding hills. Damien, Bernadette and Joseph are sure you will love both the region and their farm produce. 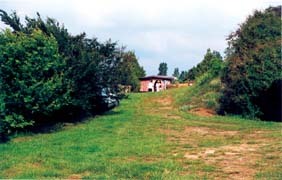 Farm campsite (1 hectare) with 6 pitches and power points. Toilet block: 2 washbasins, 1 shower, 2 WCs. Tinned/bottled cooked dishes for sale.